Happy ten year wedding anniversary to my wonderful wife! During our recent celebratory (kid-free!) 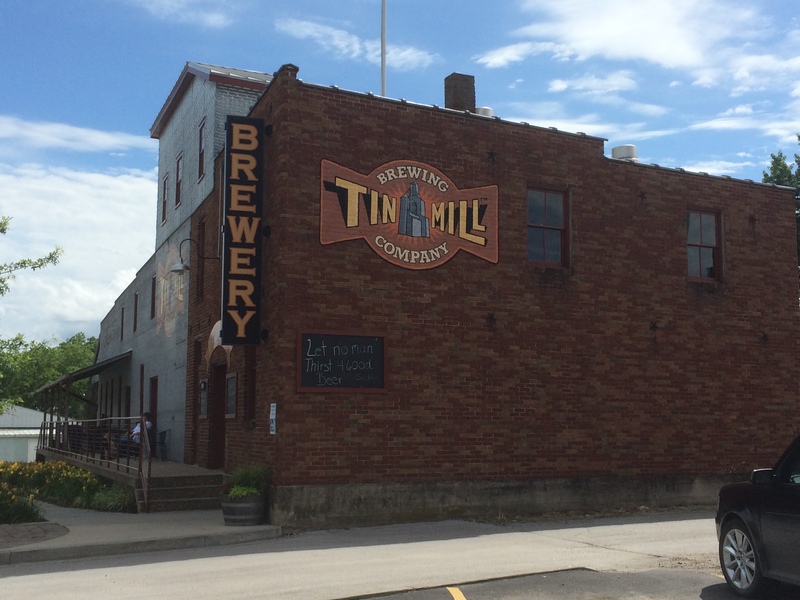 weekend to winery-rich and historic Hermann, Missouri, we made a stop at the Tin Mill Brewery, just south of the Missouri River in the middle of our picturesque state. Wine isn’t really my thing. Expensive red wine is wasted on me. I’m good with Charles Shaw Cabernet Sauvignon for $3. But Hermann is home to dozens of wineries of varying quality, including what’s apparently the oldest family-owned winery in the US. Side Note: While visiting the Adam Puchta Winery, someone ordered a Bud Light from the wine-by-the-glass booth. I’m no wine guy, but ordering a Bud Light at this place is the work of a truly remarkable dope. Even I had a glass of red wine. Bud Light is unacceptable anywhere, but particularly unacceptable here. A dozen and a half beers awaited us. 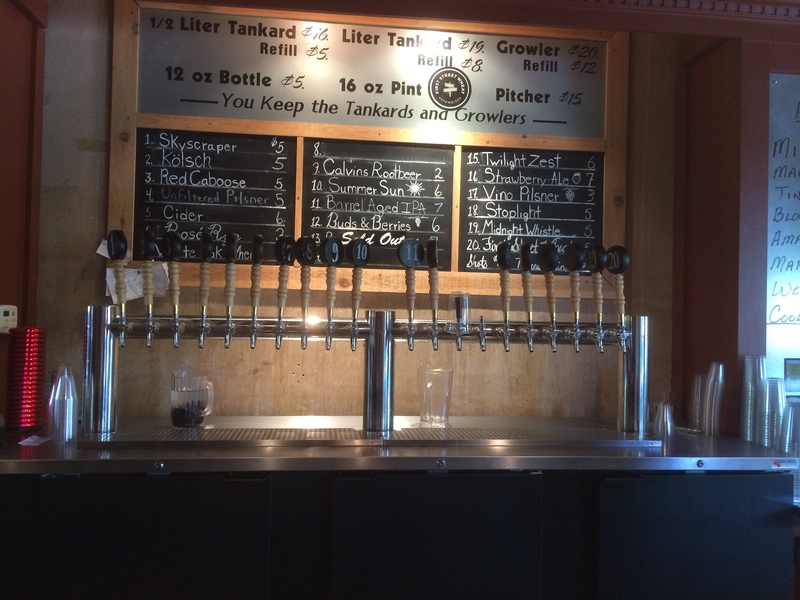 So many tap handles! None dispense wine! Beer flights are six 2 oz. 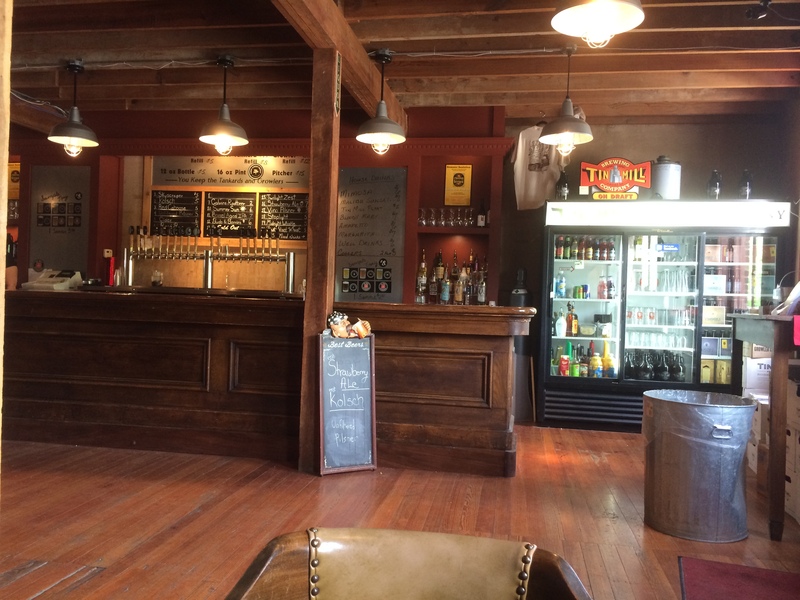 samples for $8, so… an $8 beer. The default flight includes 1, 3, 19, and 20. I chose 4 and 10 to round out my flight. Wifey chose 2 and 16. 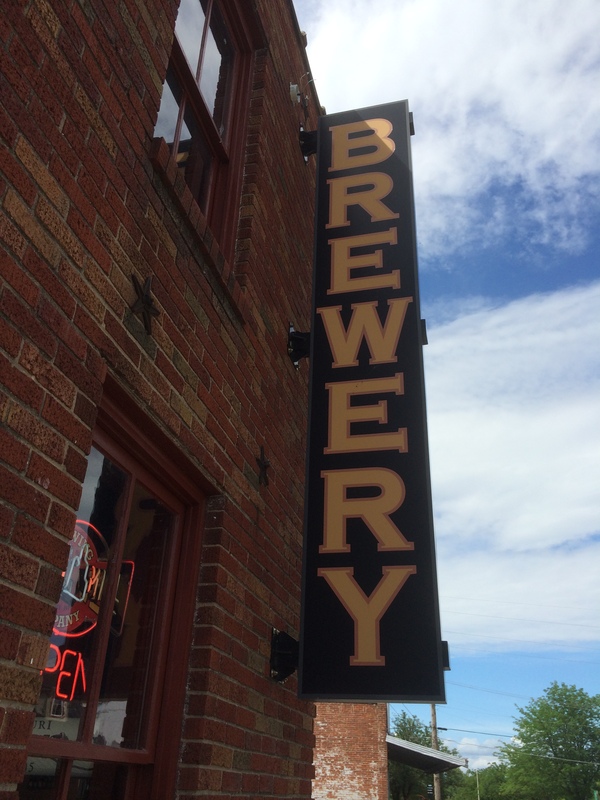 Skyscraper Pilsner – Light and airy with just a slight wheat flavor in the finish. If you were going to can one of these beers for some hefty yard work or to pull out of a cooler in a metal boat while fishing on a hot day, this is it. Quite refreshing and light. I could have gone for a heftier pilsner flavor, something a little less of a light beer. I got it later. Red Caboose – Another solid red beer to shake my general dislike of red beers, which is now turning into more of a light malaise of red beers since I keep running into good ones. This is as good of a red beer as I’ve ever had. Not too dark. It’s flat and mild and envelops the tongue with a welcoming malty flavor. I enjoyed this quite a bit, but it’s something to have with a meal, not something to plow through in high numbers on a hot, humid day in a plastic chair in a chat biergarten in the Missouri River floodplain. 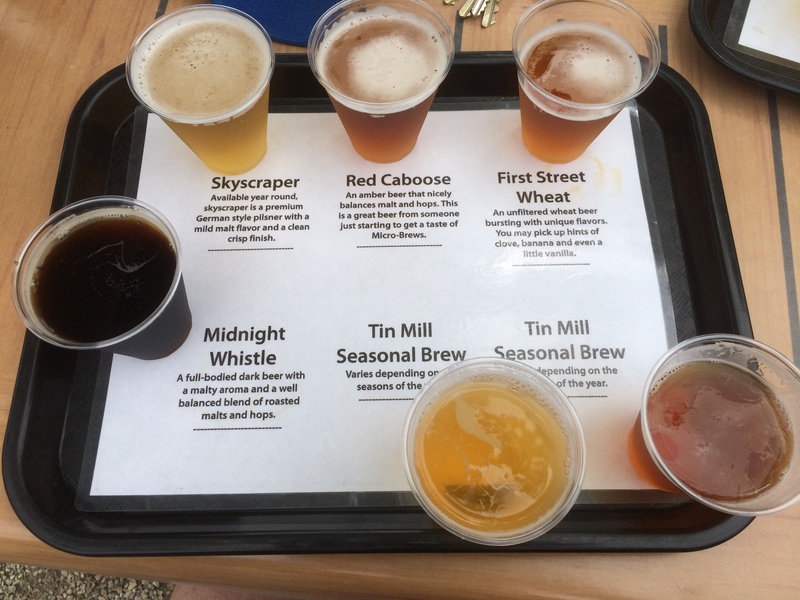 First Street Wheat – The only one of these beers that I’ve ever had before the flight. Robust orangy-amber color. It’s the most effervescent of the flight, with a hearty sour finish. I definitely don’t care for sour beers, but this had a nice zesty flavor that lingered after each sip. I got another afterwards. People like to drop lemon into their wheat beers – this one doesn’t need it at all. Midnight Whistle – Smooth and rich with strong roasted malt flavor that gives hints of coffee and chocolate. It warmed and flattened quickly in the heat, bringing it down to the right temperature to enjoy the complex flavor profile. The toasty malt flavors dominated. The chocolate-caramel flavors would make this a great beer to sip down between bites of vanilla ice cream. Hell, you could probably make a float out of this. 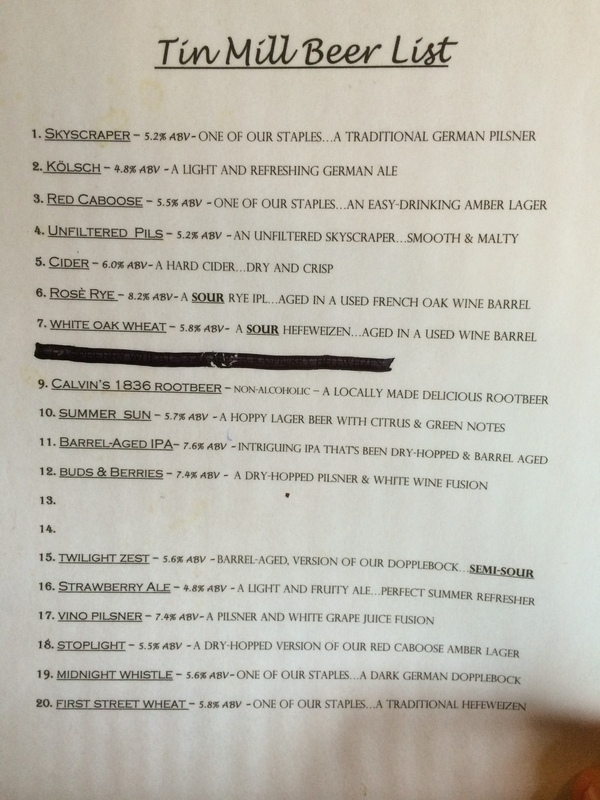 Unfiltered Pils – My favorite of the flight! Better than the filtered Skyscraper Pils, in my opinion. These are the hoppy notes I was looking for, with a better finish and crispness than the filtered version. This beer carried a slightly deeper yellow color and stronger aroma. I also got a pint of this one after my flight, and then another pint the next day while buying my take home mix pack. Summer Sun – Too bitter for my tastes, but a solid beer. When I think summer beer, I think Helles or Wheat. This was a little darker and hoppier than I’m used to for this seasonal beer. With a nice finish and a warm burnt orange color to complement the hoppy aroma, this beer will be loved by many – it’s just not quite my thing. A world of wine awaits you outside. The next day, we boarded a massive trolley that rolled around town and surrounding areas to the various wineries. As the day progressed and the humidity rose, the winery trolley turned into the obnoxious drunken bachelorette party shitshow wagon, but we still powered through. 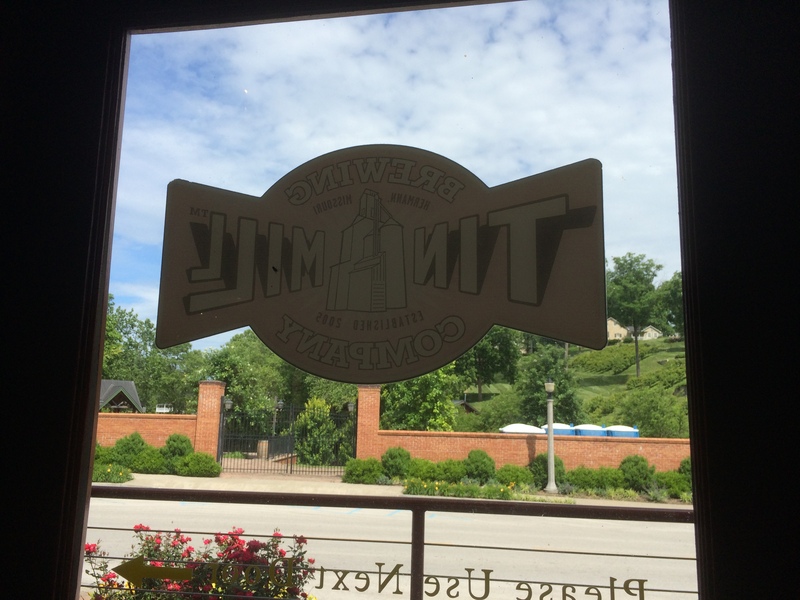 If you ever find yourself in Hermann, either by design or against your will, swing by the Tin Mill Brewery for some craft beer in the middle of Missouri wine country. 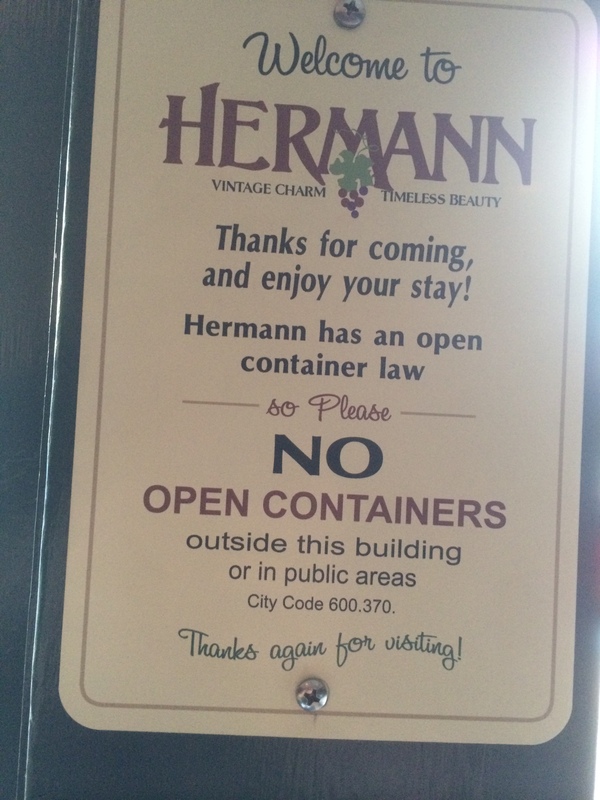 By the way, Hermann, get your act together with these weak open container laws.! WTF is this Soviet Russia? !